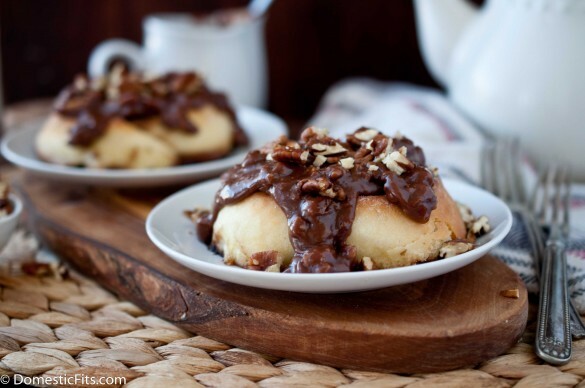 Cinnamon Rolls With Chocolate Bourbon Caramel Pecan Sauce & A King Arthur Flour Giveaway! 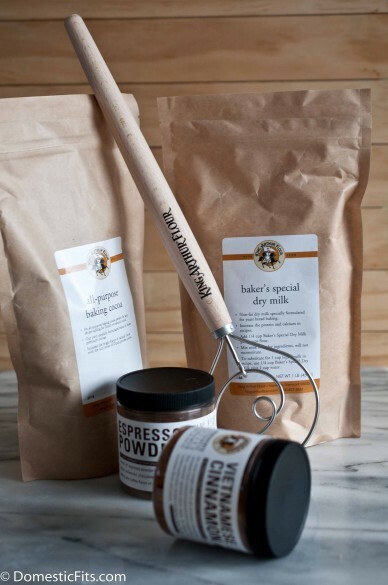 I have loved King Arthur Flour long before I decided to force my way into the blog world. I read the catalogues the way normal girls read Cosmo, curled up in bed with a glass of wine, pouring over each page. Not just for the products, but because it’s has always been obvious to me that this is a company that wants to help people learn to bake. Teach people how to make bread from scratch and the best cakes their kids have ever had. This is important to a girl that managed to reach adulthood before ever eating homemade whipped cream or even seeing a plate of macaroni and cheese that didn’t come out of a box. I had so much to learn, and still really appreciate the books, shows, and websites that helped answer my questions and feed my curiosity. It was important to me to learn how to cook, not just how to put dinner on the table. I wanted to know how to bake yeast rolls from scratch, and I wanted to know what to do when things went wrong. I found the Secret Ingredients section on King Arthur by accident and in the space of about 10 minutes my bread and chocolate cake recipes became exponentially better. I now knew the secret to rich chocolate cake and light, fluffy bread. It was like a gift. I knew that chocolate cake recipes tended to call for coffee or espresso powder, but I just figured that the flavors went well together. It wasn’t until I read the King Arthur website that I learned espresso powder intensifies the flavors of chocolate without leaving any coffee flavors behind. Espresso powder is now in every chocolate cake I bake. And the dry milk powder has taken my dinner rolls and bread to new level. Whoever figured out that dry milk powder makes bread rise higher and with a more tender texture deserves a prize. It’s really a great tip, and one that I’ve used for years. There is a huge flavor difference between the Vietnamese Cinnamon and the regular grocery store variety, it’s like Filet Mignon to Bologna. Vietnamese cinnamon is rich and smooth and bold, really worth trying is you want to cook with cinnamon, this on it’s own will bring your cinnamon roll recipe to a new level. I have also become a loyalist to the All Purpose Baking Cocoa, which has a bit of a miss leading name. The name makes it sound so average and forgettable, and it far from that. Master or All Trades Cocoa is more accurate. It pulls double duty and fits brilliantly in recipes that call for Dutch Processed and recipes that call for regular unsweetened cocoa. Good quality cocoa is a must, it makes a huge difference over that grocery store stuff. If you are going to all the trouble to bake a chocolate cake from scratch, you really don’t want your efforts washed away with weak, bland cocoa powder. Get the good stuff, it makes a world of difference. The good people at King Arthur have agreed to give away a basket of these fantastic ingredients, along with The Most Amazing Whisk Ever. It really is my new go-to, it gets the job done quickly, and nothing gets caught in it like with my traditional balloon whisk. Leave a comment telling me your favorite thing to bake during the holidays. 1. Like Domestic Fits on Facebook, leave a comment stating you did so. 2. Like King Arthur Flour on Facebook, leave a comment stating you did so. 3. Follow Domestic Fits on Twitter, leave a comment stating you did so. 4. Follow King Arthur Flour on Twitter, leave a comment stating you did so. 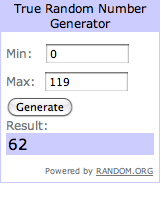 and congrats to the winner, #62 Shannon McClear! Contest Closes Monday, December 17th at Noon PST. Winner will be chosen at random. In the bowl of a stand mixer fitted with a dough hook, add 1 cup of flour, sugar, dry milk and the yeast (make sure to use yeast that is rated for higher temperatures, regular dry active yeast will not work), mix until well combined. In a microwave safe bowl, add the milk and butter, heat until it reaches between 120 and 130 degrees. Add milk to the mixer, and mix on medium, stopping occasionally to scrape the bowl. Add the yolks, one at a time, beating between additions. Add the remaining flour and beat on high until dough comes together and starts to gather around the blade, about 6 minutes. On a lightly floured surface, kneed the dough until smooth and elastic, about 6 minutes. Add dough to a lightly oiled bowl, cover and allow to sit in a warm place until doubled in size. About 2 hours. In a bowl, add all of the filling ingredients, mix until well combined (you can also use a food processor). Once the dough has risen, punch down and then roll out on a floured surface into a large rectangle. Spread the filling mixture evenly across the rectangle. Although the filling is abundant, use it all. Tightly roll the dough into a log the long way. Using a very sharp knife, cut log into 12 equal slices, about 2 inches wide. Spray a 9X13 inch baking dish with cooking spray. Arrange the rolls evenly in the pan. (if you want to make these the night before, refrigerate the rolls at this time, removing them the next morning for the final rise, which will take longer given that the rolls will be cold). Cover and allow to sit in a warm place until doubles in size, about 30-45 minutes. Bake at 350 until golden brown, about 25 minutes. In a pot over high heat, add the sugar, water and 3 tbs bourbon, stir until all of the sugar has been moistened. Clip a candy thermometer onto the side and allow to boil, untouched until it reaches 220 degrees, about 8 minutes. Remove from heat. While stirring continually, add the cream and stir until combined. Add the chocolate and stir until melted and combined, add the bourbon and the pecans, stir to combine. Top rolls with sauce prior to serving. 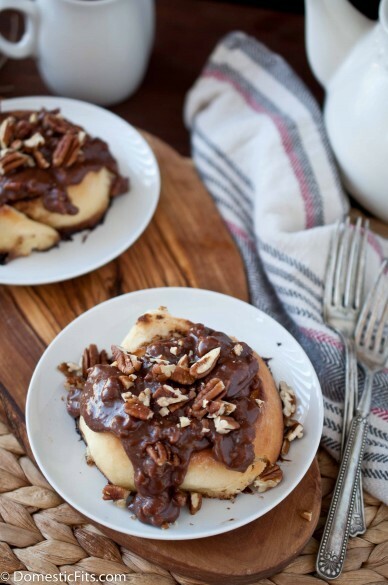 Chicken Enchilada Soup & Foodies Things To Do in L.A.
120 Responses to Cinnamon Rolls With Chocolate Bourbon Caramel Pecan Sauce & A King Arthur Flour Giveaway! My favorite thing to bake during the holiday are gingerbread cupcakes with a pumpkin buttercream….they are amazing!! I used to read it in bed too! I haven’t gotten one in ages, though–have to rectify that. I don’t have any baking traditions (yet! ), but I may pick up my mom’s tradition of cranberry nut bread. That way I won’t have to wait till she gives me a loaf to devour it! I already liked Domestic Fits on FB! I like King Arthur Flour on Facebook, leave a comment stating you did so. I make cookies from the day after Thanksgiving until the last day in December! Fave thing to bake this time of year is cookies or no-bake candy if that counts but my year-round (new) love is bread-making. Your rolls look amazing and I am just in love with K.A. products and have been for awhile. And I need to try the dry milk powder, stat. I would marry these. Take them home to meet the parents. I WANT all of them. Gorgeous as always beautiful Jackie! cookies that are very labor intense so I only make them one a year and that also makes them special. I look forward every year to making these cookies for my girls. maybe boring compared to some baked goods, but my favorite is tied: my classic farmhouse bread (SO good) and my mom’s fudge pie. It’s not the holidays without them both! and like KA on fb! I love baking anything that contains pumpkin (fresh or tinned). Almost all of my favorite pumpkin baked goods recipes are actually KAF recipes because they are practically foolproof. So, I agree that they really know what they are doing! I already followed KAF on Twitter. 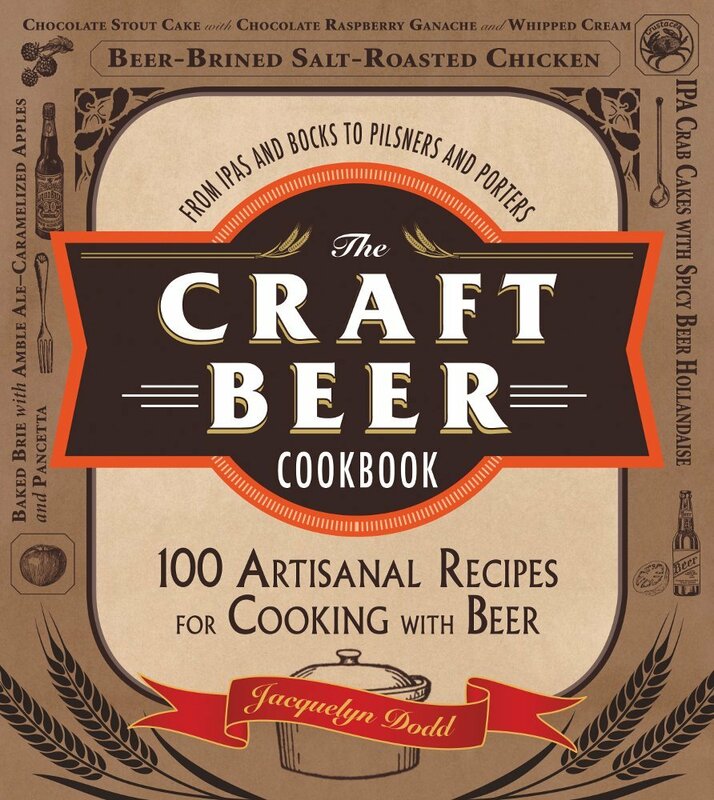 Thanks so much for the recipe and contest entries! I love making cinnamon swirl banana pumpkinbread and brownies ! I am following you on twitter & fb! One of my favorite things to bake during the holidays is baklava. It’s been a Christmas tradition in my family for a long time. It may be time intensive, but it’s delicious! Which btw is some of the best flour! Love it! I follow you on Twitter via @dreamwylde. The one thing I always have to have are the pecan snowballs our family always makes. The secret to the rich dough is that they are made with powdered sugar instead of regular sugar and real butter 🙂 YUM!!! I even made a gluten free version of these for my uncle that has celiac and they were the best cookies he has had since being diagnosed with celiac. I follow King Arthur on Twitter via @dreamwylde. Those cinnamon rolls look amazing! 🙂 Beautiful photography too. Neat whisk, I’ve never seen one like that before! I’ll have to check out the secret ingredients section, I’d definitely love to learn some tips on how to become a better and more consistent baker! My fav thing to bake during the holidays are my grandma’s sugar cookies. There’s nothing like a perfect homemade sugar cookie. I get all into the decorating too with buttercream, colored sugars.. It ends up being a work of art when I’m done! They sure do take a long time, but it’s worth the work. liked BOTH fb and BOTH twitter pages. also my favorite thing to bake is chocolate chip cookies! I love baking dark chocolate peppermint cookies during the holidays! I like Domestic Fits on Facebook! I follow Domestic Fits on Twitter! I love to bake Italian jam bars! A sugar cookie dough covered with strawberry jam. My favorite thing to make is Christmas Cookies! I love to bake sugar cookies with the kids and let them decorate. Typically we’re a little heavy on the sprinkles:). I follow Domestic Fits on facebook. I follow Domestic Fits on twitter. I follow KAF on facebook (and I also follow their baking blog!). Like King Aurthur’s Flour on Facebook! Follow King Aurthur’s Flour on twitter! Love the booze in my desserts and love King Arthur Flour, too! 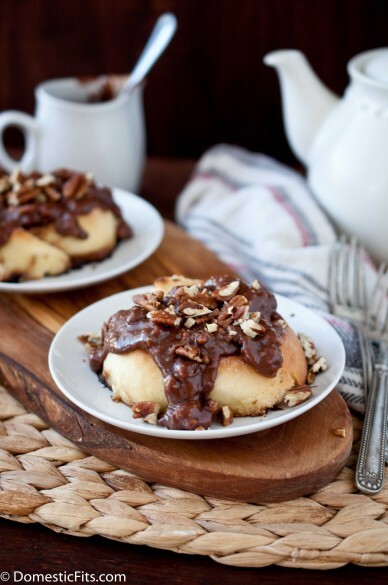 Chocolate bourbon sauce…oh my goodness. Drooling over these. My favorite thing to make during the holidays are sour cream coffee cakes. My mom used to make them every year and the smell always reminds me of Christmas. I love baking all different things but I have to make my Grand Marnier Cranberry Orange Bread (of DOOM!) every year! My favorite thing to bake is cinnamon rolls on Christmas morning. I may need to try this recipe this year, though! I have already “liked” KAF on FB and I already subscribe to them on twitter- that’s how I found your blog post. My favorite thing to make is pies; chocolate pecan, meringue, cream,or custard. Well that and soft fresh from the oven dinner rolls. Or chocolate chip cookies with dark chocolate and dried cherries. I might just have to fight Claire for the chance to marry these – I want want want. Seriously… I’m now a little obsessed with this recipe. Love to bake an assortment of coooookies!!! Love to bake gingerbread cookies. Lightly iced, they mean Christmas is near in our house. I love to bake eggnog poundcake and hot chocolate meringues. I’m not the only one who reads the KAF catalog from cover to cover?! I bake brownie boxes as gifts for the holidays (6 types of brownies per box), and those are recepients’ favorites. I already follow KAF on Twitter. Mmmmm all the best things rolled (lol! pun totally not intended) into one. I like making mexican wedding cookies (russian tea cookies)? So decadent tasting and easy but then they look like snowballs so festive! My mom’s brown sugar-cinnamon kringle! I love to bake little loaves of ginger bread and we also do biscottis. Like Domestic Fits on Facebook. Following Domestic Fits on Twitter. Following King Arthur Flour on Twitter. Magic chocolate flan cake is my new favorite! I love baking during the holidays, but I never seem to make anything the way I’m supposed to… Last year I set out to make russian tea cakes and instead ended up with nutty sugar cookies! They were delicious. I like to bake funfetti cupcakes, but use christmas-colored sprinkles instead of regular assorted colors. I like Domestic Fits on facebook. My favorite thing to make are sugar cookies. Fun to decorate and fun to share! I like baking pumpkin and sweet potato pies. I love KA as much! My favorite thing to bake during the holidays is spritz cookies. My favorite thing to bake during the holidays are flourless chocolate cakes… served with fresh homemade whipped cream. Decadent and delicious! Oh goodness, that caramel sauce is AMAZING!! I think my favorite thing to bake during the holidays is cookies, but not just any, my family always bakes the same cookies every year and it’s a great tradition! Wow – the Vietnamese cinnamon would really make my cinnamon spiced pecans extra special! I have heard and read so much bout KAF but have never used it. I would LOVE to win all those items. Fingers crossed….randomly pick me!! !